Learn what kinds of research you can conduct on GovTribe. There are several types of research you may wish to perform on GovTribe. In this article, I'd like to demonstrate how to search for a specific contract or grant. These instructions assume that you know the contract number or grant award ID, or that you know the title of the contract (or at least how it is likely to be described). Federal Contract Awards - Search the bottom level of the contract data hierarchy - the Award level - where funds are obligated. Federal Contract IDV Awards - Search the middle level of the contract data hierarchy - the Indefinite Delivery Vehicle level - which contains parent contracts assigned to a vendor, under which they can receive awards. Federal Contract Vehicles - Search Multiple Award Vehicles (or Master Vehicles) by name or solicitation number. Federal Grant Awards - Search federal grant award and spending data. If you are searching for a Federal Grant Award, start at that search page. You can then enter the grant award ID in the main search bar, or enter the title of the grant. If you are searching for a Federal Contract, and you are unsure which search page is best, I recommend you start with the Federal Contract Awards search page. Enter the contract number or contract title in the main search bar. If the contract you are looking for happens to be an Indefinite Delivery Contract or a Blanket Purchase Agreement, the child task orders will show up at the Federal Contract Award Level with the parent IDV contract number attached. So you'll be able to navigate up the hierarchy from there. If you are pretty sure it is an IDC or BPA you are looking for, you can initiate your search on Federal Contract IDV Awards. 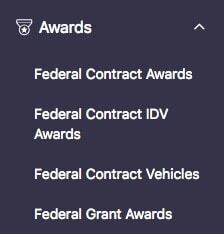 If you are looking for a specific multiple award vehicle, start your search at Federal Contract Vehicles, and enter the name or acronym for the contract vehicle in the main search bar.